3505 Lakeside Drive, Moore, OK.| MLS# 862129 | Oklahoma City Real Estate | Apple Realty, Inc.
Stocked Ponds: CHECK! Moore Schools: CHECK! Easy Access to I-35: CHECK! These are just a few amenities that make The Waters the perfect community for you! 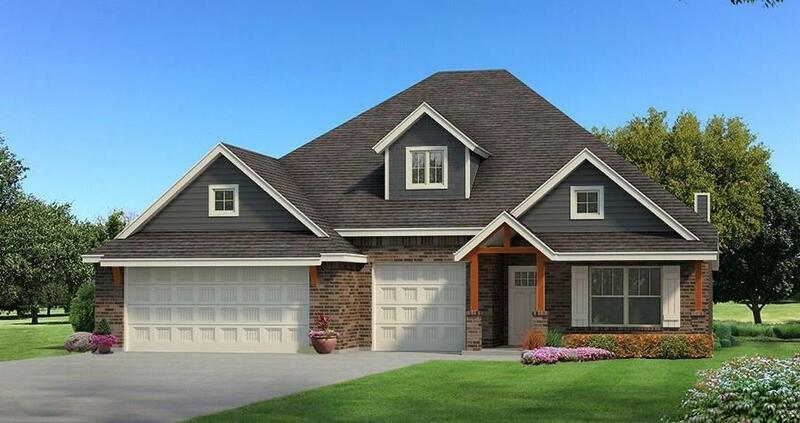 This stunning Shiloh Bonus Room floorplan was designed to make your life easier! Home has includes 2,805 Sq Ft of total living space, which includes 2,450 Sq Ft of indoor living space and 355 Sq Ft of outdoor living space. There is also a 610 Sq Ft, three car garage. This home features 4 bedrooms, 3 bathrooms and a bonus room! The living room has coffered ceiling, stack stone gas fireplace, and is secluded from 2 bedrooms with barndoor. Master suite offers a boxed ceiling with ambient lighting, 2 separate master closets, his and hers vanities, corner jetta tub, and huge walk in shower! The kitchen boasts with cabinets to the ceiling, stunning backsplash, built in stainless steel appliances, and 3cm quartz counter tops! Other amenities include a Rinnai Tankless water heater, whole home air purification, R-44 Insulation & solarboards.